I received a note from my child's teacher and here is what it said, "SHHH...It's a Secret. A lot of you know that Mrs. Grandgeorge had been an aid in our classroom this year. The kids have grown to love her. She has given so much to the students in the class, so in turn we want to give something back to her. We decided as a class that we would write her a note and give her something small. I am putting together a beach bag for her, and in it will have a beach towel and magazines. So anything the kids bring will go into the beach bag. This is not mandatory at all." My son was so excited about the gift and knew right away he wanted to get her a beach ball for the bag. So I went to the Dollar store to pick up a beach ball and ran across an ice pop making kit and a fun summer drink holder. 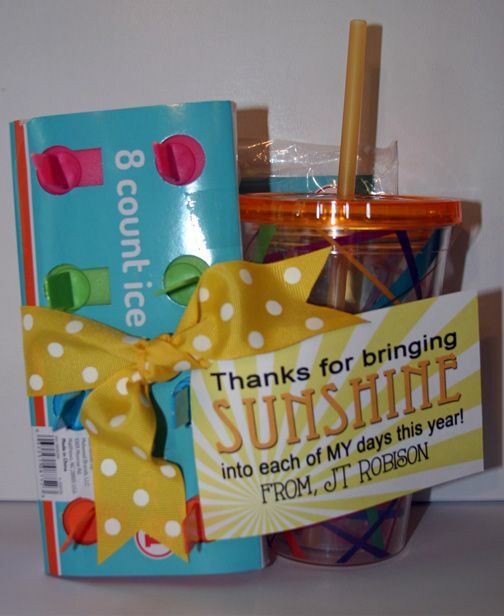 I tied them all up with a bow and added a cute tag with this quote, "Thanks for bringing sunshine into my days this year!" If you need a personalized tag like this contact Paper Perfection at jtanddolly@yahoo.com for pricing and details.